Did you know that papa penguins are devoted dads? After the female lays an egg she must leave on a long return journey to the ocean to feed and replenish her energy. Papa penguin is left behind for two months to keep the egg warm and assure the survival of the chick. 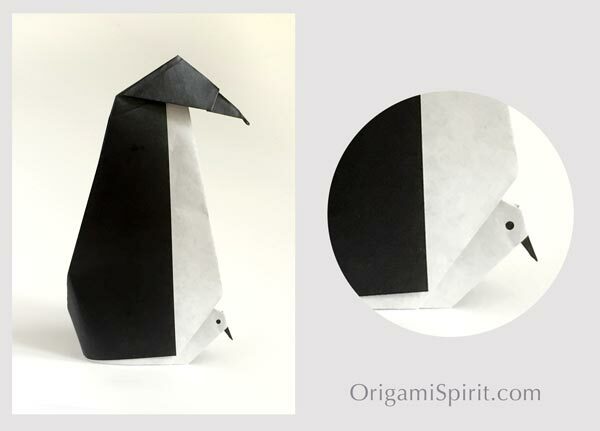 This adorable origami penguin and his little peep are made with only one piece of paper! The origami duo was designed by Anna Turner as she attended my online class The Joy of Origami. Here is the video showing the step-by-step process to make this delightful model. In the video, the penguin is demonstrated using Kami paper, which is a Japanese comercial paper that comes cut in squares. But any thin and crisp paper is adequate to make this model. The smaller you want to make this penguin the thinner the paper that should be used. The finished paper penguin shows two sides of the paper. It is best to use paper with the black on one side and white on the other. Wonderful again … thanks again and again and again, dear Leyla! I’m happy you like it, Antonie! Gracias Martha, me alegra que te guste! This is such a precious model. Congratulations Anna Turner for created this gem! And Leyla, what can I say; another superb tutorial. To listen to your voice and watch your hands create is one of my favourite things to do! Wonderful job, ladies! Thank you so much. Thank you dear Rosemary. It’s always a pleasure to share lovely origami models like these with the community!